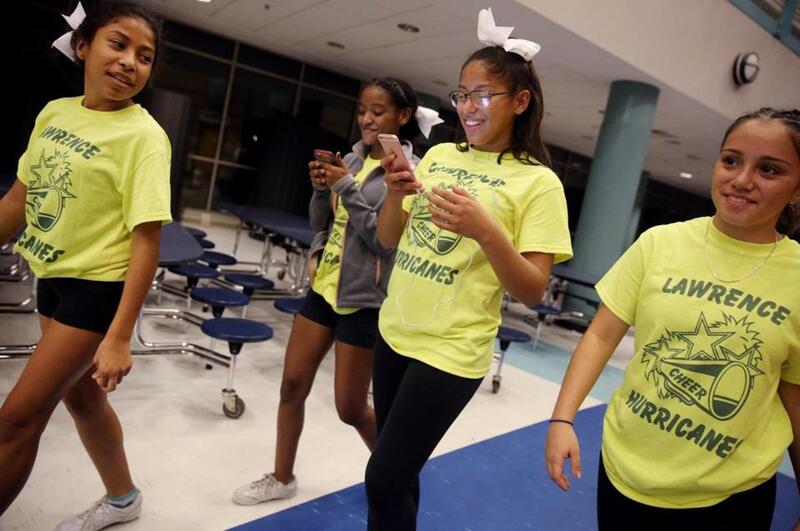 Helen Obando , 13, left, and her sister Haylee, 15, second from right, joined their teammates during Pop Warner cheerleading practice at Lawrence High School. The Obando girls never know when or where the pain will strike, only that sooner or later, it will. This is the life that Haylee and Helen Obando — ages 15 and 13 — have known since before they can remember. The girls, who live in Lawrence, have sickle cell disease, which causes red blood cells to deform into a sickle shape and stick to vessel walls. When that clumping happens, a sudden blockage can occur, depriving nearby tissue of oxygen and causing sudden bouts of pain that last days. Haylee says it feels like heavy books piled on her. Helen feels needles stabbing. About 100,000 Americans have sickle cell disease, an inherited condition that strikes mostly African-Americans, but also affects people with Hispanic, southern European, South Asian, and Middle Eastern origins. There is no treatment for children. For families, that means a day-by-day challenge, as Haylee and Helen’s mother, Sheila Cintron, can attest. Even taking turns with her husband, Cintron said she has lost more than one job because of her unpredictable absences. To ease their suffering, Cintron first tries hot packs. If that doesn’t work, then ibuprofen; next, acetaminophen plus ibuprofen. As a last resort, she will give an opioid. The girls hate the way opioids make them feel — dizzy, nauseous, sleepy. When the pain persists after two or three opioid pills, it’s time for the hospital, where the drugs are administered intravenously.